With 83% of American and Canadian brides receiving engagement rings from their fiancées, the jewelry market continues to enjoy a steady demand for certified diamonds. A timeless heirloom to be passed down from one generation to the next, a certified diamond is a perfect choice for symbolizing a couple’s eternal love and devotion. When shopping for a diamond engagement ring, one of the most important considerations is how much to spend. According to the standard rule of thumb, a buyer of a diamond engagement ring can expect to spend an amount equivalent to 2-3 months of their salary, a guideline that originated with De Beers, the world’s largest diamond producer. However, many modern couples choose to spend significantly more than this benchmark, saving up to invest in a high-quality center diamond. Although economical diamond engagement rings can be found, they’ll likely require a sacrifice in the areas of cut, color, clarity, or carat weight. Celebrities are on the other end of the spectrum: Scarlett Johanssen’s engagement ring was rumored to cost $30,000, while Mariah Carey’s fiancée purchased hers for a staggering $2.5 million. 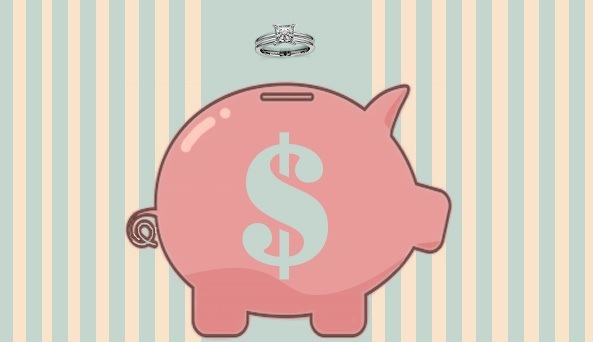 Before beginning the diamond ring shopping process, there are several factors the couple should consider to determine a specific price range that accommodates their lifestyle and jewelry tastes. 1. The couple should make a list of the preferred characteristics for the diamond engagement ring, such as shape, size, and setting. One bride might prefer a pear-cut diamond, while another may be less concerned about the diamond’s shape and more interested in its color. 2. Financially, the couple should take stock of their current salary, debt amount, and credit rating. If they plan to finance the cost of the ring, they’ll need to determine the amount they can afford for the monthly payment. If a major purchase has recently been made, such as a house or car, this can sometimes impact the available funds for the diamond. 3. Opting for a simpler setting is a great way to get more diamond quality for the dollar. Many couples choose to focus on investing in high-quality loose diamonds initially, and then upgrade to a more elaborate setting later. 4. If a couple is planning an extravagant wedding and reception, they may not have as much to invest in the ring. On the other hand, opting for a small, understated ceremony may allow the couple to indulge in their dream certified diamond. In addition to signifying a lifetime of love and loyalty, a diamond is a financially sound investment that will continue to hold its value for years to come.